Copenhagen's Grand Central Station built in 1911. The first Central Station in Copenhagen was built in 1847 - mainly to serve the very first 30 km railway line in Denmark - from Copenhagen to Roskilde. The property was located on the same spot as the present Central Station. As the railway network expanded - the second Central station was built in 1864 - on the opposite side near the Axeltorv complex - and was a part of a huge railway centre. 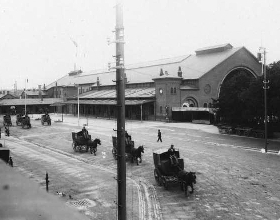 The third and present Central station was completed in 1911 - in connection with the new tube and underground boulevard track to Østerport Station - which was operating in 1917. 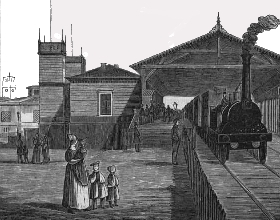 Picture of the first Central Station in Copenhagen from 1848 that was built in 1847 to serve the very first 30 km. railway line in Denmark from Copenhagen to Roskilde and visa versa. A new Central Station replaced it in 1864. 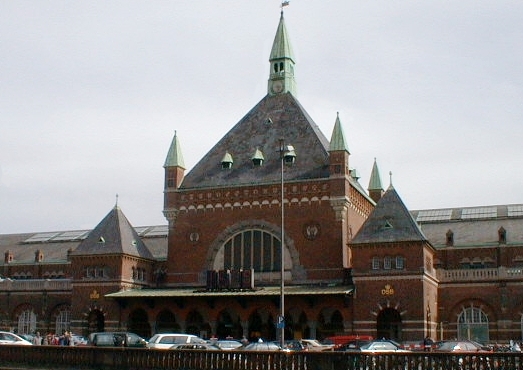 The second Central Station was built in 1864 and covered a huge area around the Axeltorv complex. 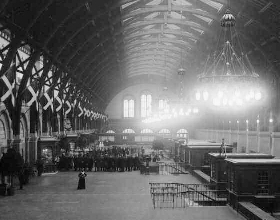 The station was demolished in 1912 - when the present Central Station was inaugurated in 1911. The present Grand Central Station in Copenhagen called (Københavns Hovedbanegård) is the third Central Station and was inaugurated in 1911 by prince Christian - later King Christian X (1870-1947 - king from 1912 - 1947) together with 700-800 exclusive invited guests and thousands of Copenhageners. The Central Station is the biggest train station in Denmark - and centre for all train traffic in the country - as the station is served by S-trains - and regional trains as well as InterCity and international trains - with departures to major cities all over Europe. The new City Ring and Metro's fully automatic trains will stop here around 2018. 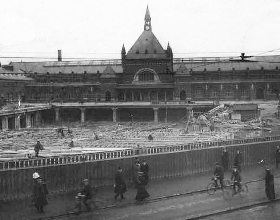 The present Station building during completion in early 1911 - with the world’s most expensive hole in the middle - which was constructed to vent the exhaust steam from the steam engines before entering the station. Inauguration of the Central Station took place in 1911 - with Prince Christian and many prominent persons as well as thousands of excited Copenhageners. The day after the opening ceremony 36 trains departed from the station. The building is designed in the same style as Copenhagen’s Town Hall - as both properties were built in the same period - and the railway complex is equipped with a special lounge for the Royal family - with departure from the Royal Saloon from platform 1. There are altogether 12 platforms - 7 for public commuters and 5 only for luggage and a joint concourse for arrival and departure. The Central station has undergone several overhauls latest in 1980 - where lifts and escalators were established together with a well functioning shopping arcade and restaurant facilities. In 1983 the station buildings was preserved - to prevent changing of the original architecture and construction work. In 2004 a major restoration of the station was in progress and will be completed in 2008 - with the platforms brought up to international standards. 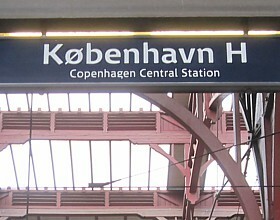 Copenhagen Central is the main hub and international intersection for all Scandinavian trains - plus for all domestic connections to all cities in Denmark. Thousands of cycles are parked alongside the Central Station area every day - and millions of train tickets are sold yearly to the busy cycling commuters. When inaugurated in 1911 - there were 36 trains departing from the new Grand Central - and up to date - more than 1470 different trains leave the station daily. On an average day almost 110,000 commuters and visitors are utilizing the property of the station facilities. 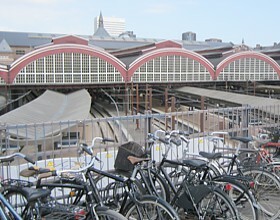 And everyday between 3000-3500 bicycles are parked alongside the station area. Every month 310,000 train tickets are sold - which makes it a total of almost 3.8 million tickets a year. The entire staff - including the working force operating the trains at Copenhagen’s Grand Central Station - amounts 1800-2000 employees. The Central Station is the international intersection for all Scandinavian trains - and also for all domistic connections to all parts of Denmark. There has altogether been tree big "Clocks" in the main hall at the Train Terminal since it's inaugurated in 1911. Let’s meet “Under the Clock”. Let’s meet “under the clock”. 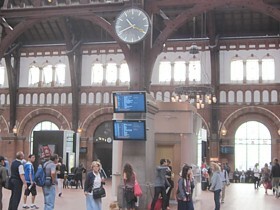 The famous "Clock" at the Central Station has for generations been the most traditional meeting spot in Copenhagen. Just ask a Copenhagener! In connection with the 100 year anniversary for the Central Station - the famous “Clock” was portrayed on a Danish stamp in 2011 - and also to indicate that a new "Clock" had been installed. For generations of Copenhageners - the most traditional and practical place to meet in Copenhagen is “under the clock” - just inside the main entrance - and in the middle of the concourse of the Grand Central Station - which also is a favourite dating spot. Look up at the big "Clock" in the main hall - next time you pass it - and just imagine the millions of Copenhageners - and other commuters from all parts of Denmark that have met for several rendezvous - family gatherings - pick-up by relatives or friends - or for numerous other happy and trilling occasions in connection with a train journey. The present "Clock" is new - and is the third of its kind since the Central Station was inaugurated in 1911. All old "Clocks" have been trough an auction - and sold to the best bidder at the highest price - as these "Clocks" have quite an affection value for collectors. The old "Clocks" was also a historical - sentimental and nostalgic symbol for many Copenhageners during the past. 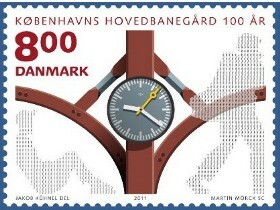 In connection with the 100 year anniversary for the Central Station - the famous “Clock” was portrayed on a Danish stamp in 2011. 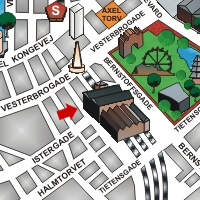 The Central Station is located beside Tivoli - The Liberty Memorial - and near the Town Hall Square. There are lock up luggage boxes with individual locker facilities. The Price for 24 hours is approx. DKK 50-70 - depending if you use a luggage box - or storage your luggage at the left luggage section.